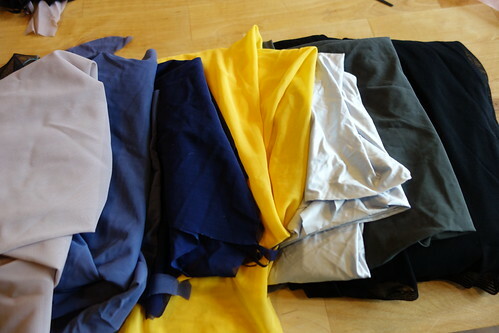 Arne has commissioned us to make him a pair of datagloves for coding. 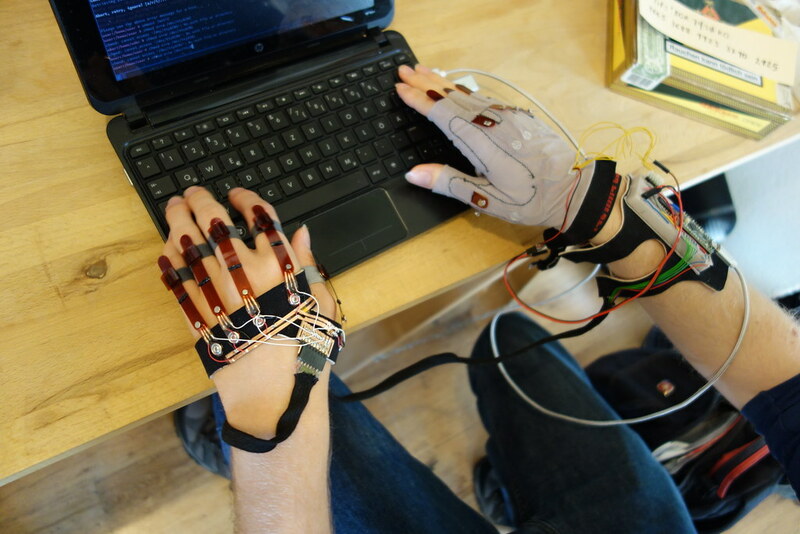 He wants to be able to code with the slightest movement of his fingers. 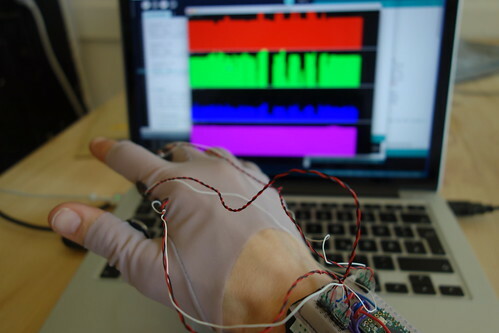 We’re working on a series of test gloves to evaluate different sensors for detecting slight finger movement. Arne has been thinking this idea through in quite some detail. 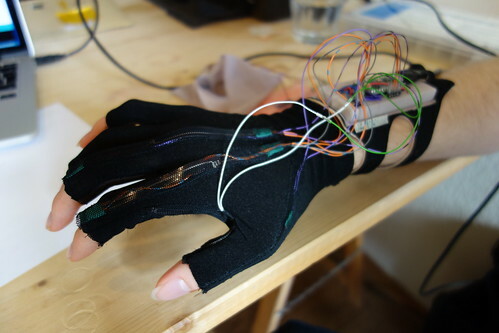 The goal is to be able to input all the keys of a keyboard with as little finger movement (effort) as possible. 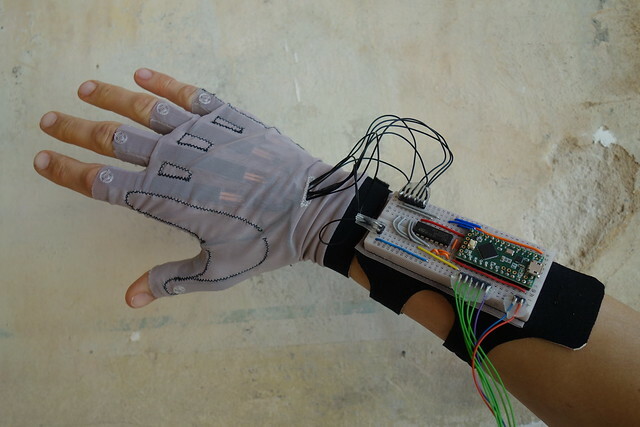 Instead of only sensing downward movement of the fingers, the sensors on the glove should also detect upwards movements. 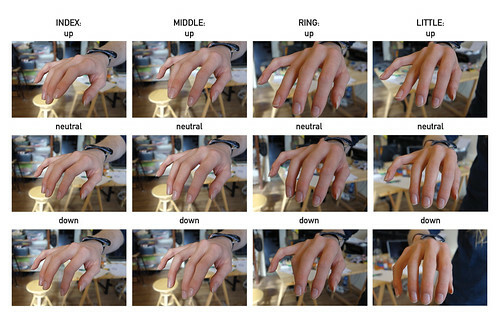 Meaning each finger can move either up or down – allowing it to “input” two different states. French: Fourchette, the French word for fork. 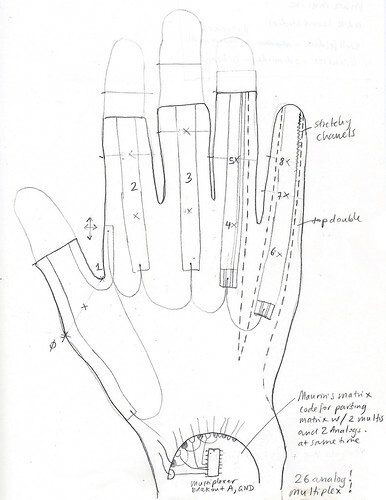 In English, a technical term for a type of dessert fork, a component of a glove. 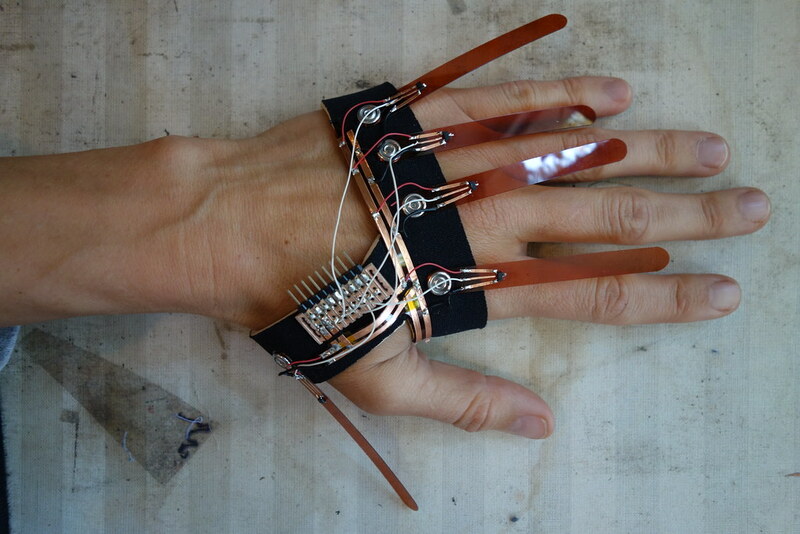 HCF4051 Single 8-channel analog multiplexer/demultiplexer on each hand to capture all the bend sensors. 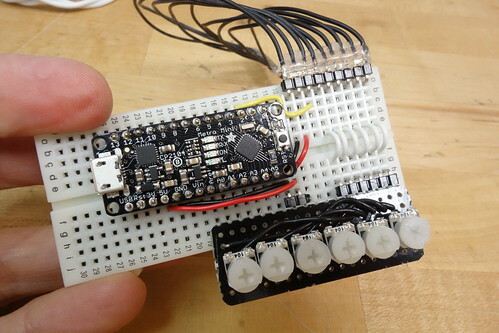 Magnetic sensors go directly to board. 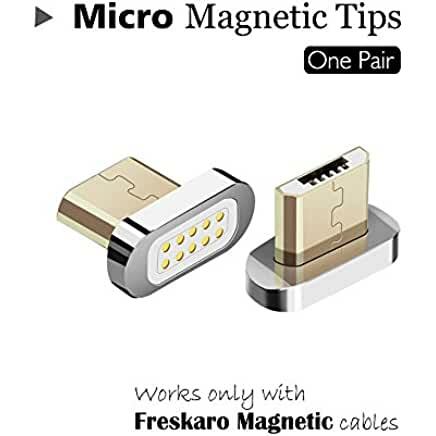 Could be interesting to get a magnetic quick break-away connector for the USB connection to Teensy on wrist. 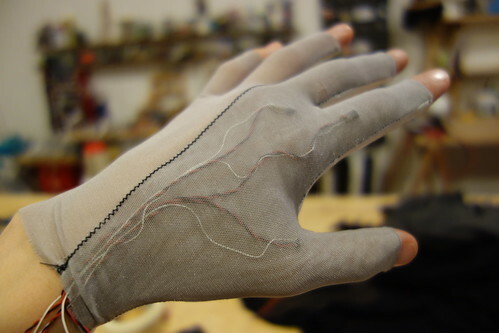 Sensors moving around and small movements come from fabric, not actual finger bend. 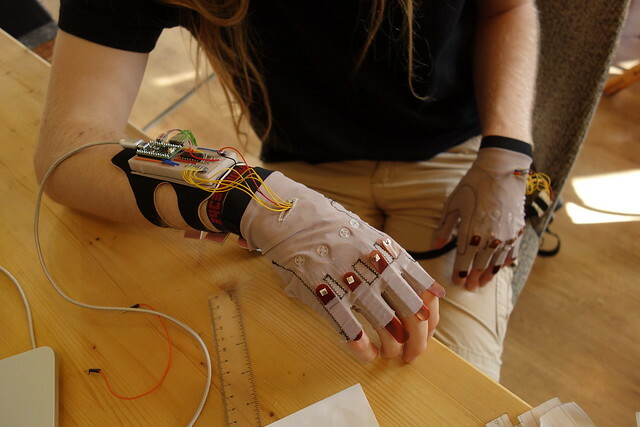 Arne came with feedback and decided to work on a next iteration that explores the use of non-stretch fabric/material to maintain fixed distances between sensors to (ideally) eliminate cross-talk. Are we getting to something like the P5 Dataglove for gaming? 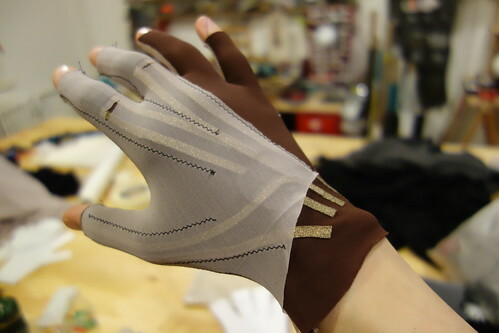 Before leaving for a long summer holiday, we made this quick test to see how it could work to use non-stretch fabric in Arne’s glove design. 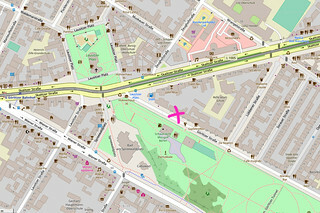 It looks promising and we will get back to it when we get back to it. Five months later and a summer in between…. 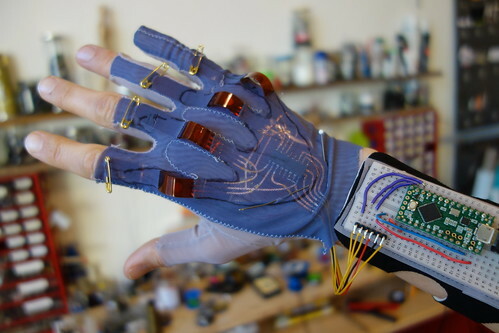 we pick up work on Arne’s programming gloves again. 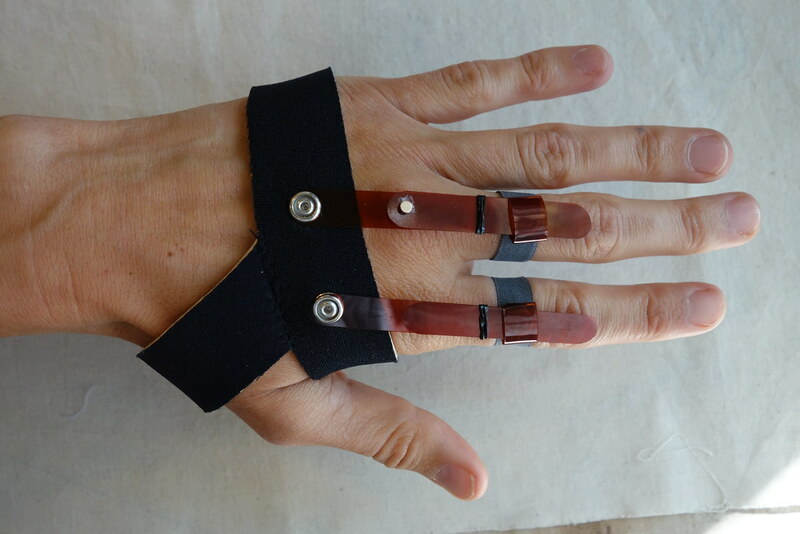 He has written to say that bending one finger pulls at the fabric and affects other sensors on the hand. 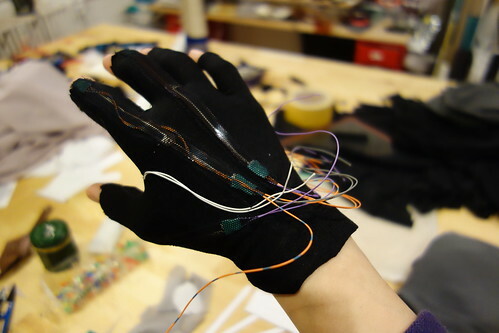 In an attempt to solve this issues we thought about trying to construct part of the glove where the sensors are mounted out of a non-stretch fabric. 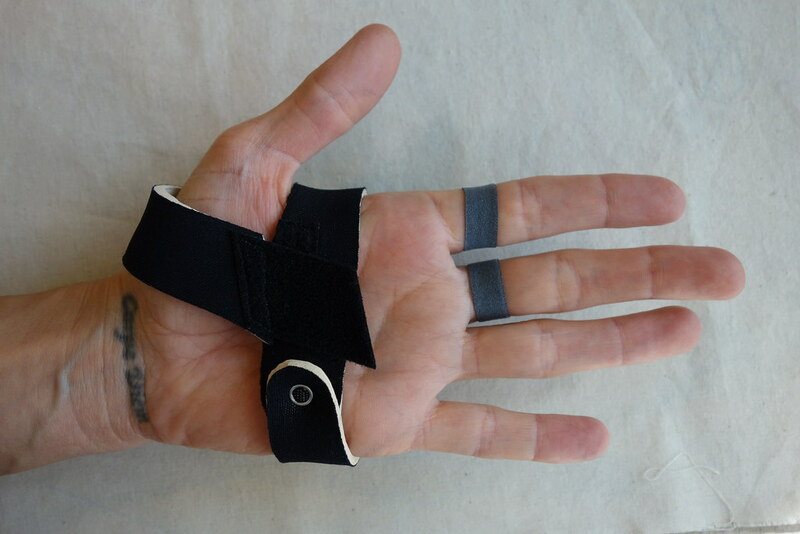 The downside of a non-stretch band around the palm is that it can’t be strapped as snug. 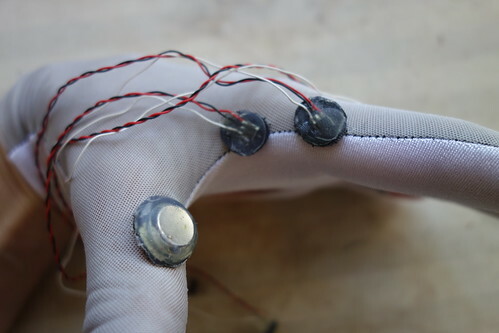 We were just recently working on Tom’s limb link sensor and using a neoprene with one raw side for grip against the skin (the other side is fabric fused). 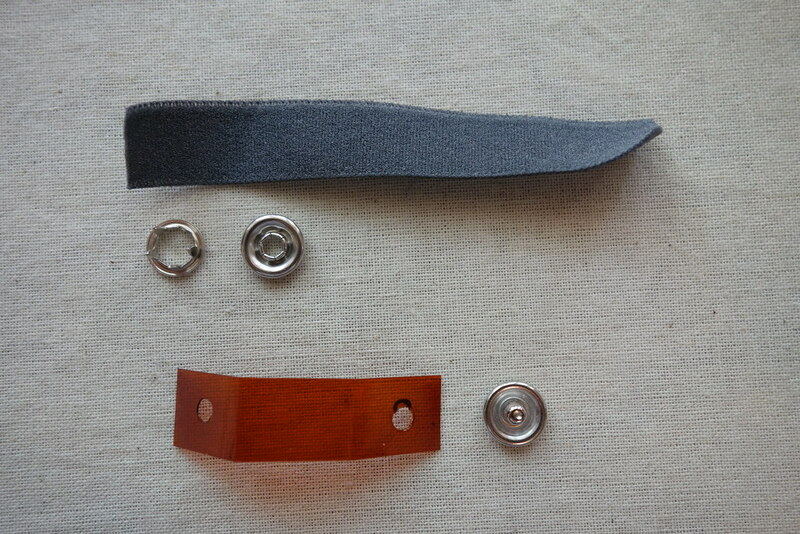 We have some 4mm thick neoprene of this kind that looks like it will work quite nice as a more stable material for a palm strap – instead of just the powermesh glove previously. Here a video of the strap to show how little it moves when the fingers move. 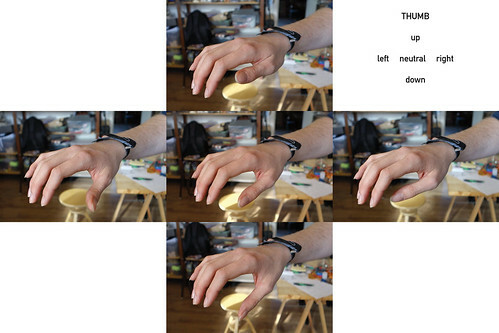 As soon as the thumb moves it begins to move more, even when the extra thumb strap is removed. 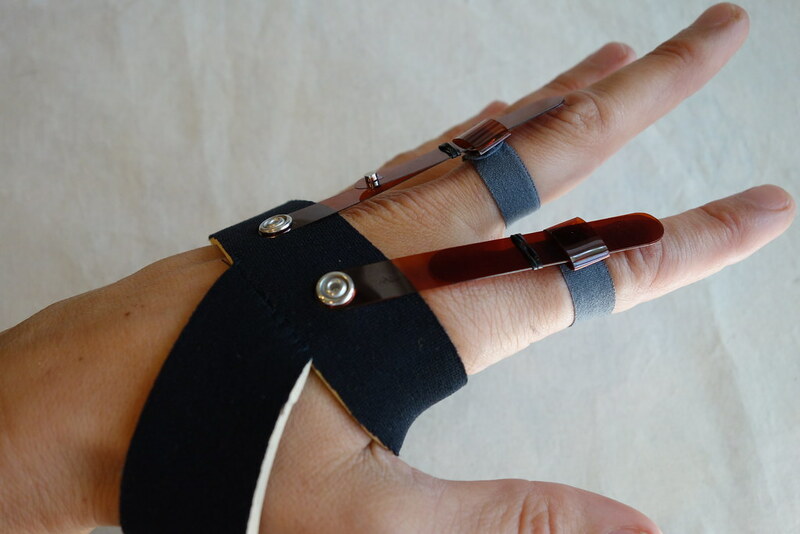 Instead of mounting a full glove with this palm strap, I’m experimenting with having the sensors fixed on the PALM BAND and inserted into little kapton SHEETHS mounted atop individual elastic FINGER RINGS. This looks to be working very nicely. 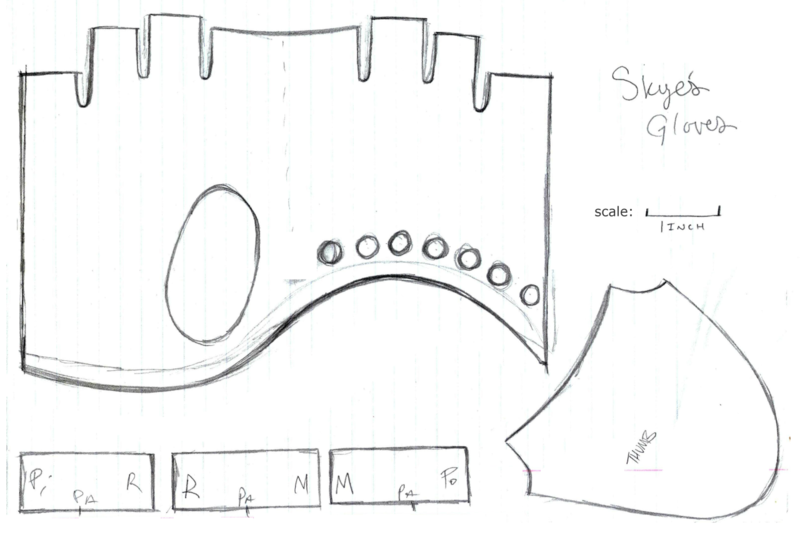 I just wonder how precise the design needs to be and if what I am now making to work on my hand will also work as well for Arne’s hand. 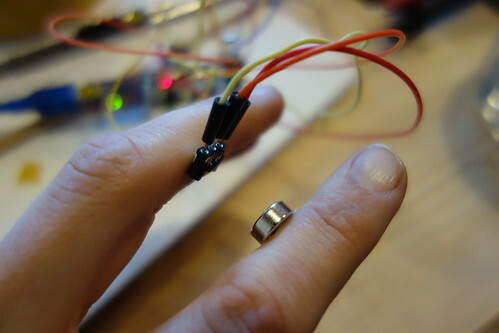 The loop on the ring for the sensor shaft to slide through is made by crimping a female snap on some soft stretch elastic to make a closed loop ring. 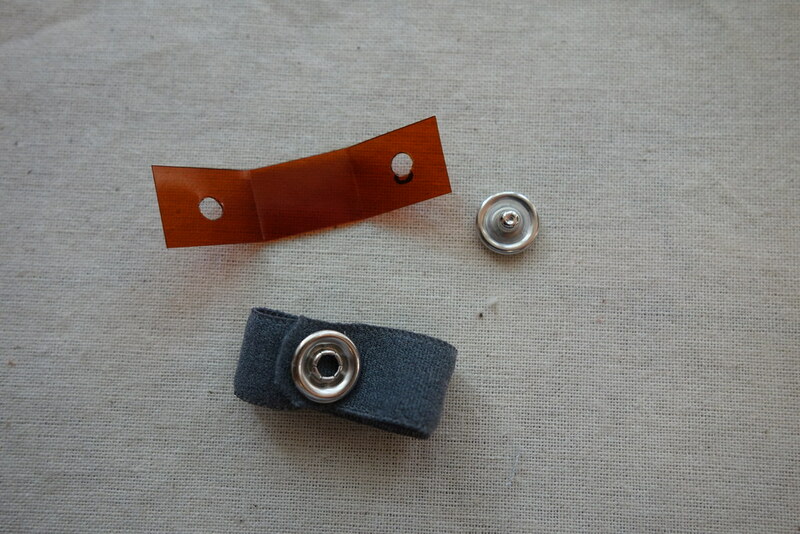 Then a strip of kapton is folded and hole-punched and the male snap presses through the two holes and into the female snap on the ring to form the sheath and attach it to the ring. 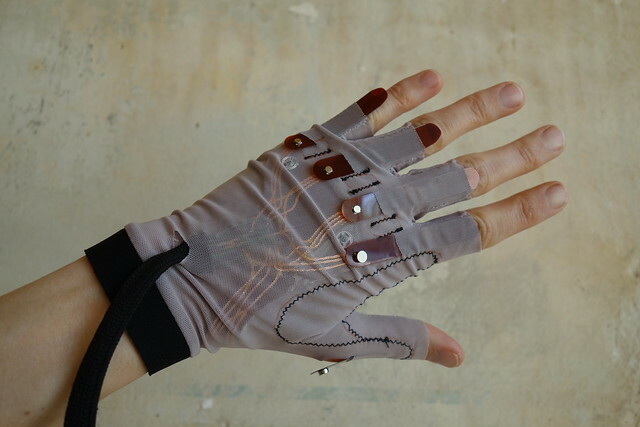 The nice thing about these snaps is that they work as a pivot around which the materials can move as the fingers move left and right. 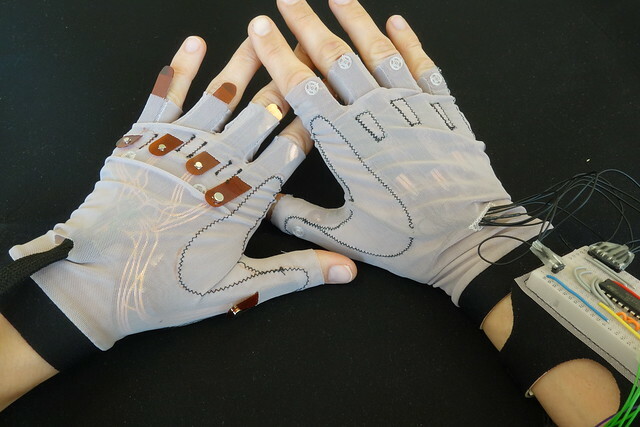 The sensor shafts are held on the PALM BAND with another snap, similar to the previous design. Q: Any chance we could combine all kapton sensors into single piece and solve circuit in copper tape? Q: Is it a problem that rights shift over time? 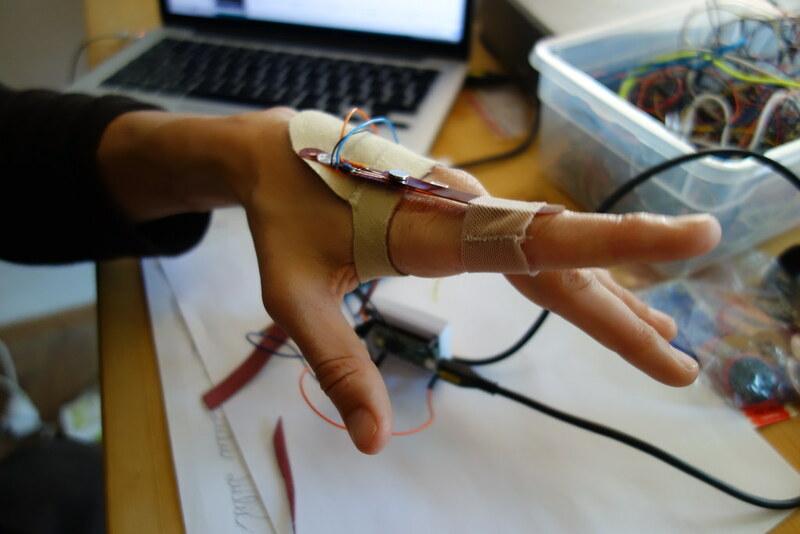 Q: Does thumb movement affect finger sensors? 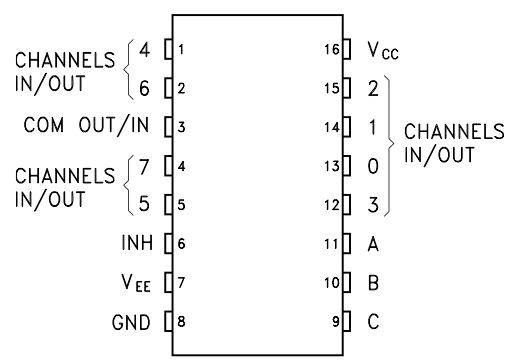 Q: Do magnets stick to sensors and solder too much? Q: Is the length of the levers okay? 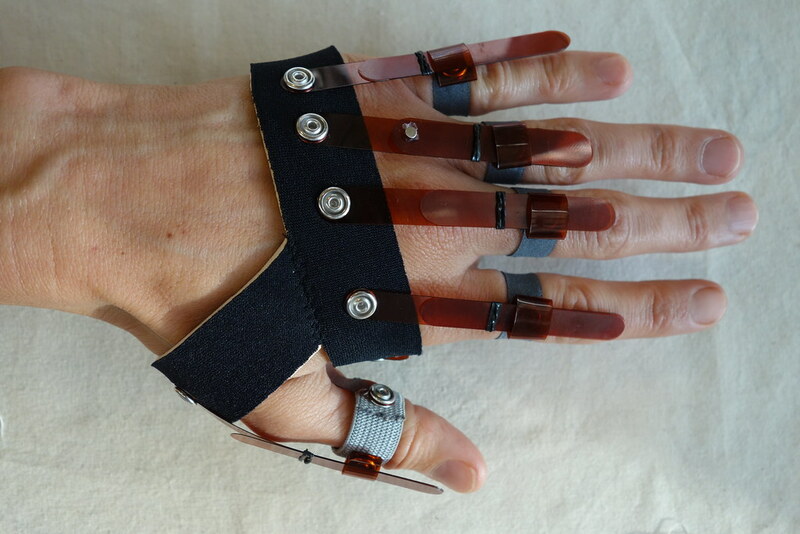 – Distance of sheath mounted on FINGER RING needs to be as low profile as possible (close to skin) while still allowing sensor lever to move back and forth smoothly (no resistance). 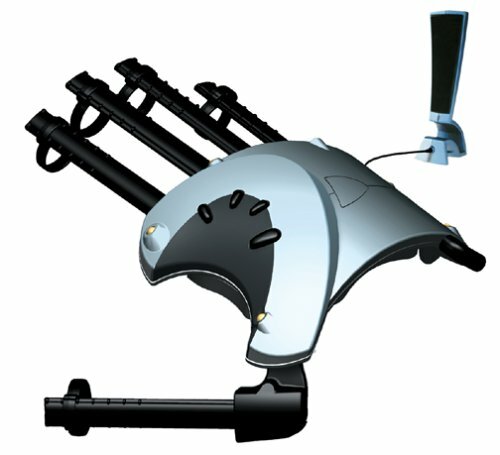 – Elastic solution for adjustable sensor lever to magnet lever should be replaced by solution that does not meet with skin. 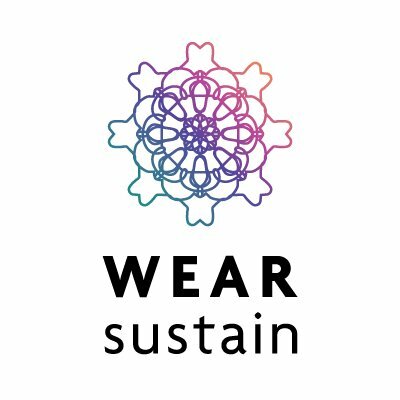 – PALM BAND is tight and sweaty – make it 3cm longer and mount snap at next meeting, possibly perforate neoprene to make more breathable. 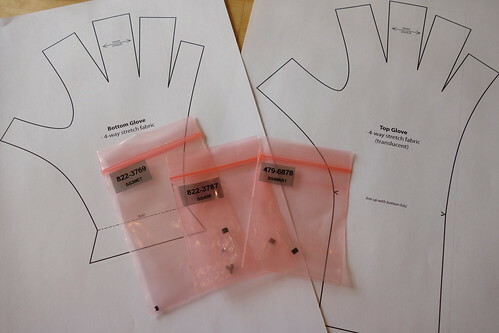 Could try making PALM BAND as narrow as possible – only as wide as the snaps (7mm). 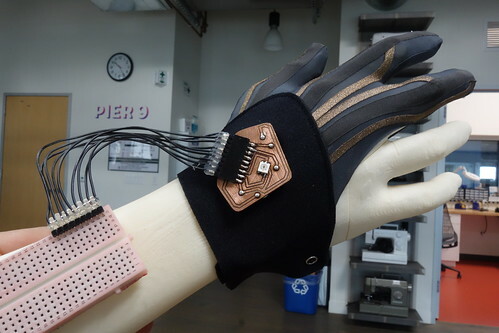 – Forget bend sensor between index and thumb for now, instead mount second thumb sensor. – FINGER RING fitting: little, ring = good, middle, index, thumb = slightly tight. 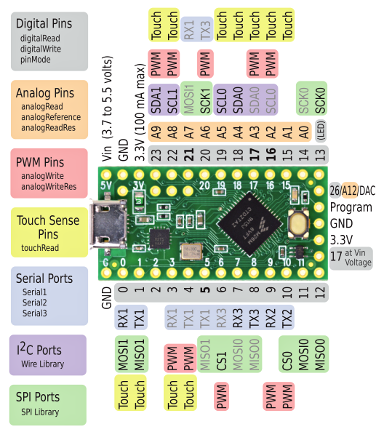 – Solve circuitry more elegantly. – Order larger diameter (4mm), lower profile (0.5 or 1mm), weaker magnets because current magnets (from Modulor) are so strong that they their attraction to the Magnetic Field sensor component messes with their free/smooth movement. – Fix sensor lever to magnet lever at far end? – Fix magnets more permanently (not immediate issue). 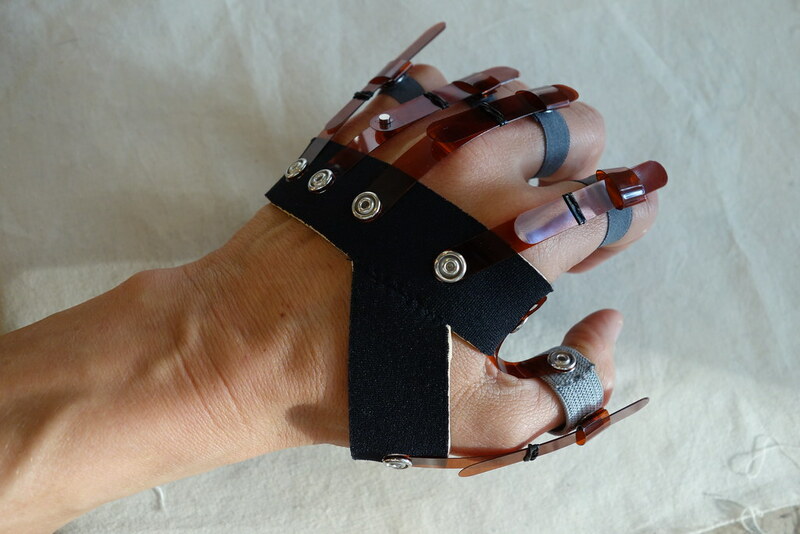 – To have finger bend move magnet back and forth (linear displacement) instead of angular displacement….. but came to conclusion that then the mounting of FINGER RINGS would need to be exact. Discarded this idea again for now. 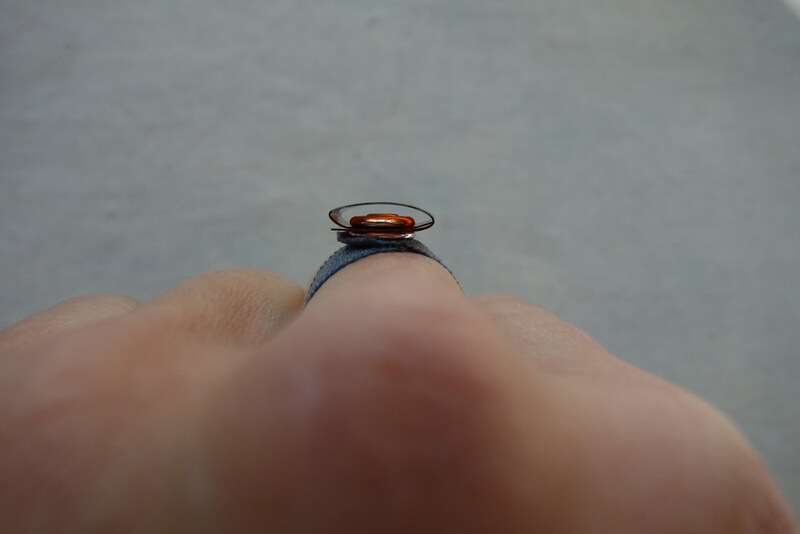 – new FINGER RINGS with low profile sheath. 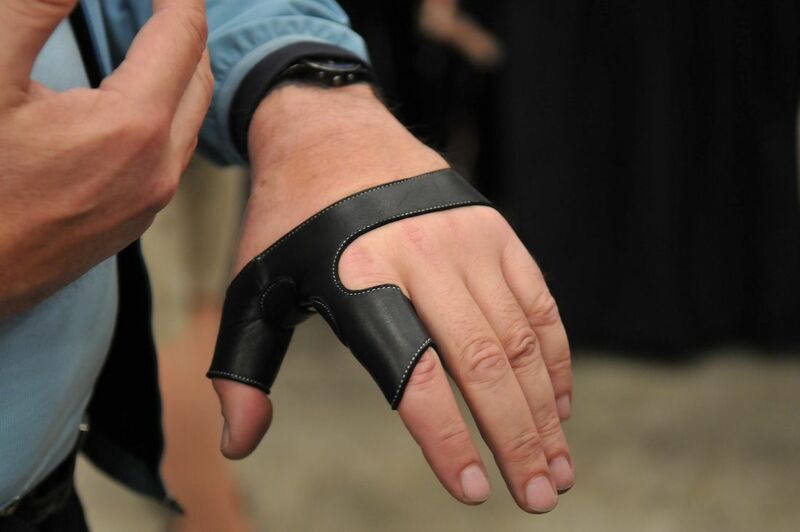 – longer/narrower/more breathable PALM BAND. 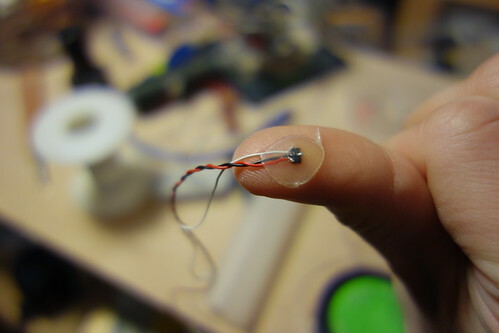 – second thumb sensor (1.6cm apart). 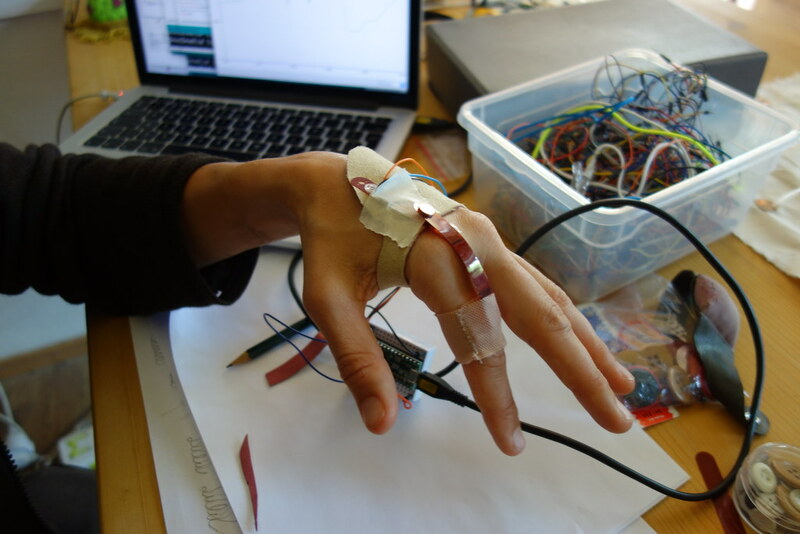 DIY bend sensors just like in the Dataglove Flex Sensor Rig. 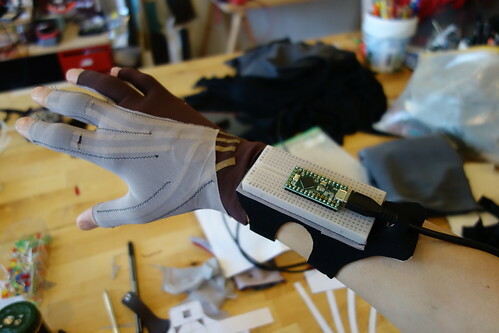 Breadboard the inputs with pull-up pots just like for the DIY VR Glove. 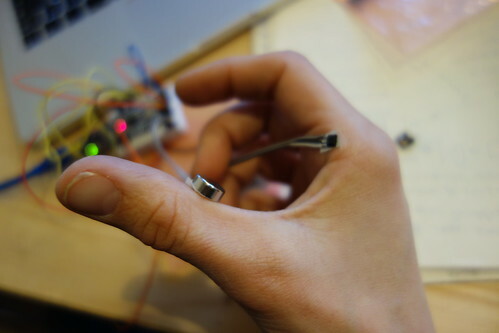 Maurin is using both analog ports of the Teensy to read even faster from two multiplexers.